Head out to Arcadia for a lovely, lip smacking, finger licking good Greek meal! They offer traditional Greek cuisine while using imaginative recipes. Regular patrons swear by the Boukies, Spinach Pie, Arcadia Salad, Hilopites Pasta, Chicken as well as Pork Souvlaki and Octopus cooked in vinegar and grilled. How popular is Arcadia Restaurant? People normally club together Frissiras Museum and Baby O while planning their visit to Arcadia Restaurant. The breakfast I had here was one of the largest and best breakfasts I’ve had during my 3 months of traveling. Phenomenal Greek omelette with house-squeezed orange juice, croissant, bread, and honey/butter/jam. If I had stayed in Athens longer, I would have come back every day. The host of the restaurant (not sure if he was the owner or not) is also very kind and attentive. 5-stars, hands down. My visit to Arcadia was amazing. Starting from the service, which was amazing. They really tried to make everyone feel special and welcome there. 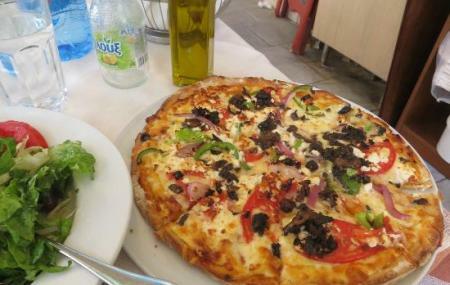 The food was amazing, would have to say it was the best I had during my stay in Athens. Also the small surprises they added to the experience. Every visitor got a small surprise, which was different for every group. Some got an extra desert, some got a small shot of local cocktail, which all tasted great. It also helped that they took an interest in you and where are you from and when we left, the server thanked us in our own language, which I think was a neat extra feature. I would definitely reccommend this place when visiting Athens. One of the best places to eat in Athens. Great service with free ouzo served with the check and even better free starters. Main dishes was superbly good and the service - proffesional. Wish to go back there sometime.